Developments in personal mobility devices such as electrical power mobility scooters and electric wheelchairs have given back convenience, mobility, and self-reliance to numerous senior citizens plagued by limited range of motion. The following is an assessment of both personal mobility products, which includes information along with the strong points and weak points of each. * 3 Wheel Mobility Scooters – These specific types usually provide much better handling in restricted quarters and more leg space compared to other alternatives. * 4 wheel – Made for a bearing weight of up to as high as 500 lbs, these scooters provide you with extra stability and sturdy mobility compared to the 3 wheel mobility scooters. * Compact scooters – For scenarios where storage space or transportation choices are restricted, these scooters collapse to make it possible for placement in limited places be it in the home, vehicle, or van. Steering and control of electric powered mobility scooters is generally performed through handlebars very similar to those found on bicycles and perform best for owners that happen to be not afflicted with upper body range of motion problems. Top speeds average around 8 miles per hour, with higher power versions usable on streets, rough ground, and up steep inclines. One more advantage of these particular scooters is the fact moving them takes merely a basic trailer which could conveniently be mounted on the rear of a vehicle. Personal mobility scooters are a very affordable option to re-building an individual’s movement, independence and self-reliance. Scooters, ranging in cost from $1,000 for a standard model to $5,000 for one that is completely equipped, are more affordable in price compared to electric wheelchairs. Developments in electric powered wheelchairs have more or less removed the outdated viewpoint on the “loaner chairs” offered at airports, malls and amusement parks and substituted it with an individual mobility alternative full of advanced functions and features. These types of chairs include 4 to 6 wheels, easy maneuverability, and programmable joysticks for convenient steering. Made for people with greater range of motion problems, these electric powered wheelchairs provide toughness, stability, and a wide variety of seat motion choices such as motor-driven stand, tilt, support, and recline features that can be customized to personal requirements. Three key disadvantages of electric powered wheelchairs are that they don’t collapse down, their significant weight, and their price. The heaviness and non-foldable nature of the chairs greatly restricts their use with regular vehicles, lifts and light duty haulers. These kinds of chairs work a lot better in custom-made vans in which 4 point tie-downs result in a more safer and steady ride. Cost-wise, electric wheelchairs are the priciest kind of personal mobility vehicle with costs for enhanced electric wheelchairs going up to around $15,000. 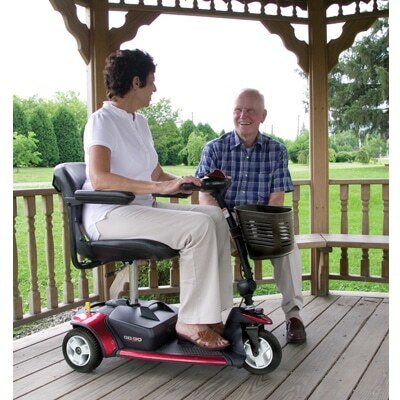 Choosing the best personal mobility product relies on an evaluation of requirements.